The aim of the biomechanical power analysis is to control the training process. In Nordic and alpine skiing the factors power and jumping force are very important. Therefore maximum isometric strength and different jump performances will be tested. 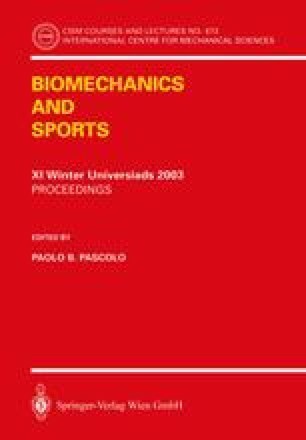 By testing the athletes over several years longitudinal analysis make it possible to compare the mean values of performance parameters from athletes between 14 and 19 years of age. This was done for cross country skiing, ski jumping and alpine skiing. Furthermore specific requirements like strength endurance will be checked with special tests like performing 35 squad jumps in 70 seconds to see the rate of lactate increase. The latest advancement is to analyse fast contractions at high velocity movements. To realize this future trend, three-dimensional analysis of external and internal loads must be done. In addition we are in need of a powerful diagnostic machine that allows high velocities for dynamic strength tests. Leadoff examinations at velocities of 0.2 and 0.8 m/s had been carried out. There the comparison of ground reaction forces (external load) and the intersegment moments (internal load) showed differences between the position of their maxima and the characteristic run of curves.